Arabic fonts, because of their distinctiveness and decorative appeal have driven the world of fonts and graphic design into a tizzy. 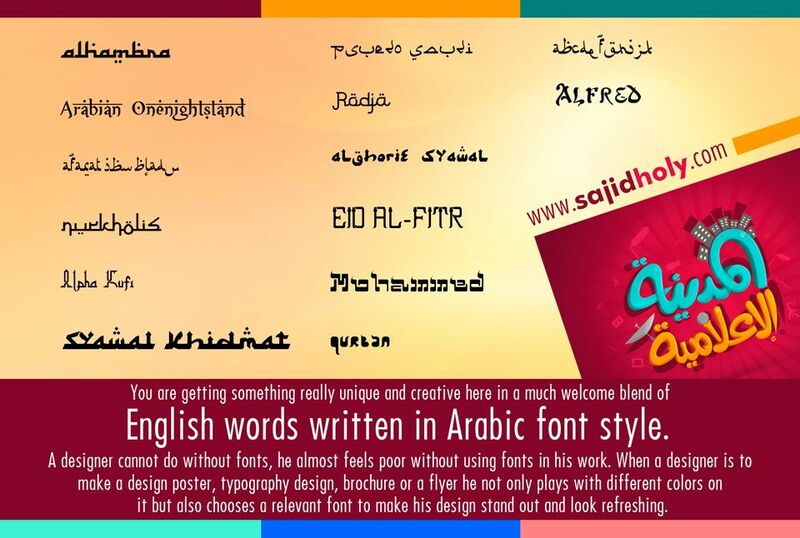 Calligraphic fonts are highly rated and that’s why the demand for Arabic calligraphic fonts has been peaking in the last couple of years. Designers are experimenting with the font and inventing never-seen –before design and art elements – textures, patterns, font characters and so much more! One day the prophet (sallallahu alayhi wa sallam) asked his companions: “Do you know who is a poor person is? The companions replied that a poor person is a person who had no money or property. The Prophet (sallallahu alayhi wa sallam ) replied: ‘The poor person from among my ummah is one who will come on the Day of judgment with a good record of prayers and fasts and zakat (Obligatory charity) but also has abused somebody: Slandered someone: Stolen the wealth of another, had killed or beaten someone. Then all the oppressed persons will receive a portion of the aggressors’ good deeds. Should they fall short of his aggression, then the aggrieved person’s sins and faults, will be transferred from them to him, and he will be thrown into the Fire (Hell)!” Tradition by Imam Muslim. No doubt alcohol is intoxicating, and contains this substance that makes people lose their minds. It says in the hadeeth, “Every intoxicant is khamr, and every khamr is haraam (forbidden).” If this is the case, then alcohol is considered to be forbidden and to come under the heading of “khamr”(wine, etc.) which people drink for relaxation or enjoyment. During the month of Ramadan we arrange lavish functions for the breaking of fast, a good practice to bring people together. However, if in these functions, we make it a habit to focus on understanding one of the passages of the Quran, probably we can make better use of these gatherings. It would not take us more than 5 to 10 minutes to reflect on the message of the Quran in these functions, but it would help us understand the divine guidance, the main reason for decreeing fasting in this month. "The month of Ramadan in which was revealed the Quran, a guidance for mankind and clear proofs for the guidance and the Criterion (between right and wrong). So, whoever of you sights the month, he/she must observe fasts that month and whoever is ill or on a journey, the same number (of days which one did not observe fasts must be made up) from other days. Allah intends for you ease, and He does not want to make things difficult for you. He wants that you must complete the same number of days and that you must glorify Allah for having to guided you so that you may be grateful to Him. (2:184). Copyright ©2019 Sajid Holy - All Rights Reserved.